The Lancashire teen hurt in the London terror attack has spoken of the moment the terrorist’s out-of-control car came speeding towards him. Owen Lambert was laughing and joking with his friends as they set out to explore the sights of London on a university trip. But within minutes the teenager’s carefree day out in the capital turned into a nightmare as a terrorist struck. Owen and four friends – all politics students on a visit to the Houses of Parliament - were walking along Westminster Bridge when terrorist Khalid Masood drove a Hyundai 4x4 straight at them. 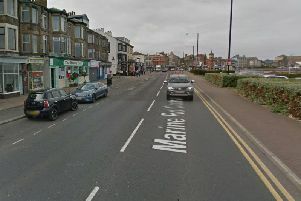 The 18-year-old from Morecambe was hit by the speeding car and knocked to the ground. “It all happened in a split-second,” said Owen. Owen fell onto his friend Travis Frain, 19, who had been walking in front of him and was also struck by the vehicle as it hurtled along the pavement towards Parliament, ploughing through groups of pedestrians. “I saw blood on Travis’ neck and I said to him ‘You’re bleeding’,” said Owen. “But then he gestured to my head. I put my hand to my head and it was just red with blood. I realised it was my blood on Travis. Passers-by and paramedics raced to their aid as Masood continued on his deadly path, crashing the hired car into the gates of Parliament. As Owen sat dazed on the bridge, clutching his wounded forehead, Masood burst into the grounds of Westminster. He stabbed unarmed police officer Keith Palmer before being shot dead by armed officers. PC Palmer and three pedestrians who were on Westminster Bridge died of their injuries. Owen saw many other people lying injured on the pavement and in the road all around him. “I saw a police officer with an assault rifle – he shouted ‘Shots fired!’ and then ran towards Westminster,” he said. The first person on the scene to help Owen was a young woman called Alice. “She came over to make sure we were all right, she put her hand on my shoulder and said everything is going to be fine,” said Owen. Owen spoke to his frantic mum Sharon by phone, assuring her he was all right. A police officer then bandaged his head wound as paramedics tended to Travis. At that point Owen had no idea where his other two friends from the party of five had gone. “I heard somebody saying that people had gone over the bridge into the water,” he said. After around 15 minutes, two police constables escorted Owen to a nearby hotel. A photographer snapped Owen as he was led him away from the bridge – picture would later be spread around the world’s media to show the impact of terror. After being checked over by paramedics, Owen was transferred to the Chelsea and Westminster Hospital where his head wound was treated. He said: “Thankfully, tests proved that I had no internal injuries. “The staff were incredibly upbeat, helpful and lovely caring people. After being interviewed by police, Owen was discharged from hospital before midnight. On Thursday morning, Owen returned to Edge Hill by train and bus. There, he was reunited with his parents, younger brother Dale and grandpa Frank. “I was over the moon to see my family,” he said. Owen then returned home to Morecambe on Thursday. He expects to stay at home for a few days to recover before returning to university. The Lamberts have been overwhelmed by the messages and support they have received from well-wishers, which have been non-stop since Wednesday afternoon. “The messages wishing Owen a speedy recovery from family and friends have been a huge comfort to us all,” said his mum Sharon, who works for Bay Medical Group in Morecambe. “We also want to say a big thank you to the passers-by, the staff at the hospital, the police and everybody who looked after him. Owen, a former Morecambe Community High and Great Wood school pupil, said he was thinking of the families of those who died and were critically injured in the terrible events of Wednesday afternoon. “I can’t begin to imagine what they’re going through,” he said.